Few instant message conversations and email exchanges, I maintained “it was okay, no big deal, surely some other time.” It did not dawn to me until the week when the group departed that I was actually very much missing the trip. You know the kind of thing that you think will evade you but then it comes right at you. So I resolved that the only way I was going to get out of this rut was to escape and do some good hard hiking. 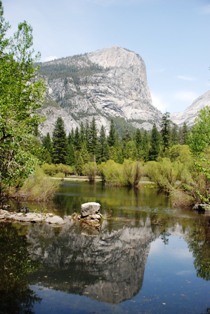 An intensive search over the Internet over possible destinations led to two alternatives – Yosemite or Mt. Shastha. Mt. Shastha was someplace I had been always longing to go since child whereas Yosemite was a recent interest. Not really sure why, but after finishing a good Latte at the corner of Powell and O’Farrell I picked out Yosemite in a split-second decision. I hurriedly called few friends asking them to tag along with me, however with no luck. It was already end of Thursday and most people had plans made up for the warm weekend that was forecast. I booked the cheapest tent I could find at the Curry Village for one night. After which I strolled down Pine Street to the Amtrak booth (near the Ferry building) at the Embarcadero to get myself train ticket for Saturday (it was too late for Friday’s departure). 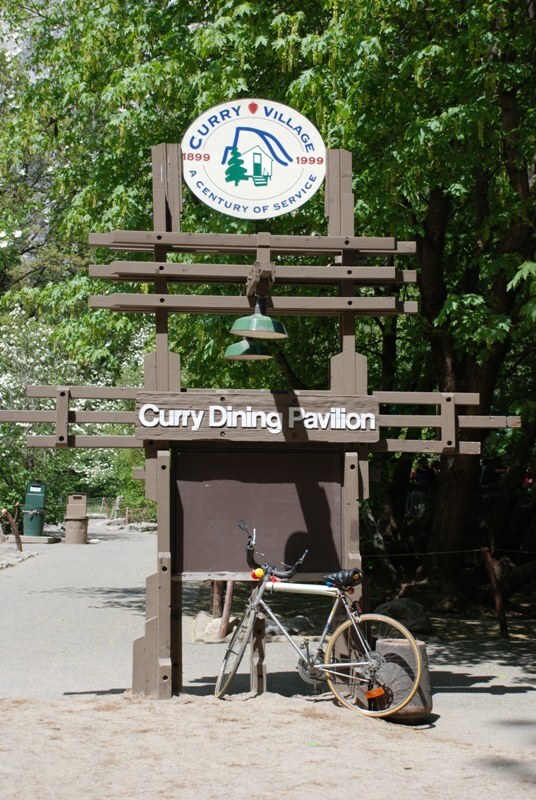 When I got to the registration desk at the Curry Village in the valley, the credit card payment was still in pending status. The payment had not gone through yet and I had to show my ID to reconfirm the payment. Over Saturday and Sunday I logged more than fourteen hours of hiking over pleasant and enjoyable trails of the Yosemite valley. 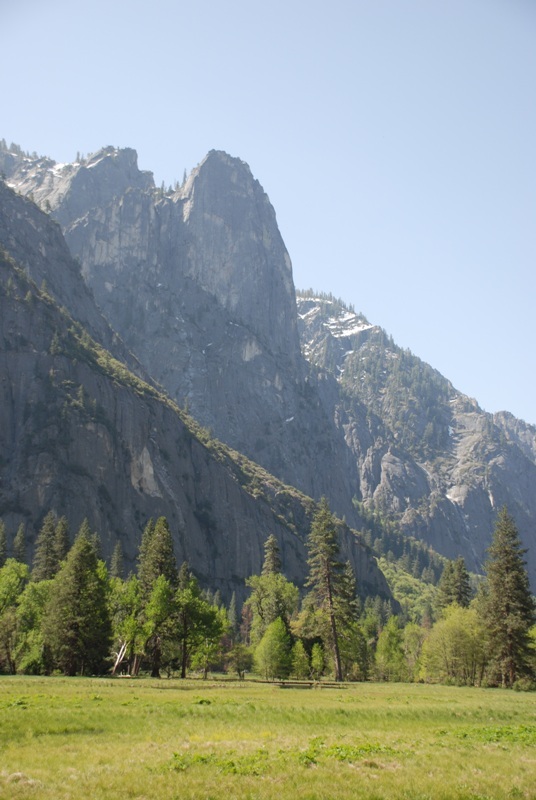 Of all the hiking I did in California during the short period of stay, this desperate escape to Yosemite turned out to be the best. It was still not okay that I had missed the trek to Everest base camp, but this was the best alternative I could have had. 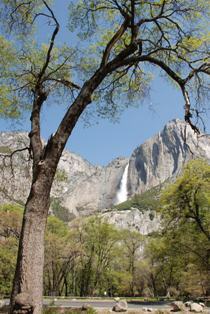 PS# I cannot do justice to Yosemite with just two days of hiking. I had barely scratched the surface here. Most of the hiking that I did was without the camera, just enjoying nature. Plain and simple. However I did manage to drag myself to take the lightproof box with a flash bulb on a number of occasions. Some of these pictures are shared below. Please click on the images to enlarge. 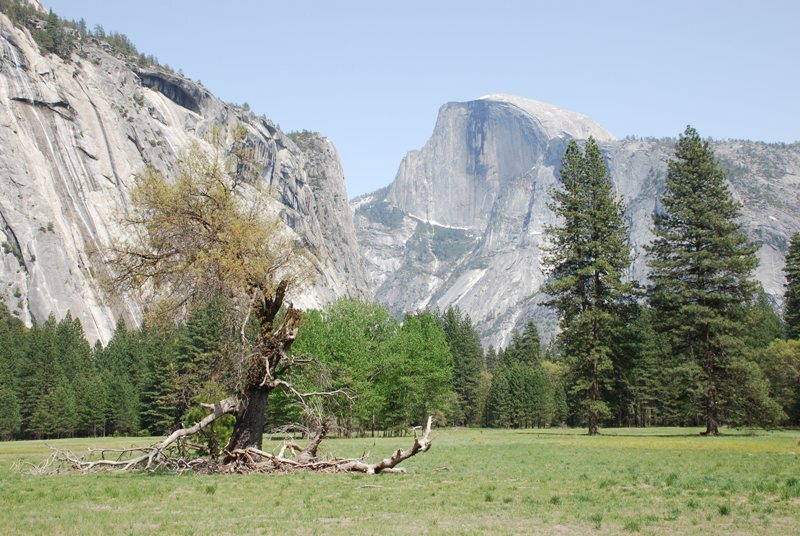 Panoramic view of the Half Dome, and the lone tree. When you look at the rock face on the distance, the name “half dome” becomes obvious as to why its called just that. 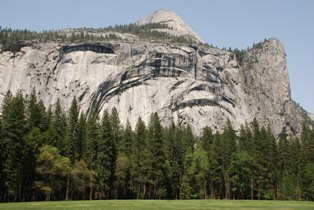 However according to a North American Indian legend, a woman named Tissiack turned into “Half Dome” because she offended the spirits. From the valley floor the elevation gain to Half Dome is 4,900 feet and it is a 16.8 miles round-trip which is approximately a ten to twelve hour trail. 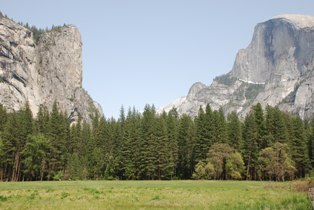 Half Dome is one of the prominent images associated with Yosemite. 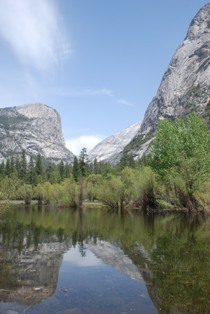 There are many vistas in the valley to take good scenic pictures of Half Dome. One good spot is from the Sentinel bridge with the Merced river in the foreground. This dramatic nature sculptured rock face is named Royal Arches. 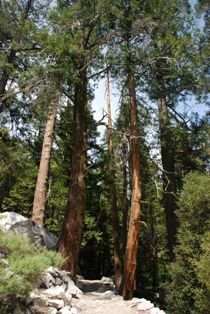 I captured this while walking from Curry Village to Yosemite Village, parallel to it. It is interesting to note that the spectacular rock structures in the Yosemite Valley were actually formed underground and later exposed through erosion of the top earth by glacial waters and other forces of nature. 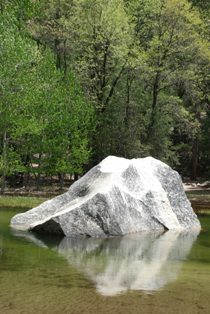 The gigantic rock structures were created when granitic rocks were molten underground some 80 million years ago and gradually cooled and solidified. After million years of glacial and other factors of erosion, now we can see a spectacular valley full of huge rocks, many waterfalls, swooping cut valleys, and other geological enigmas. Tents (more canvas cabin like rather) lined up in the Curry Village. Each tent has a bear-proof container on the outside (the small green box). 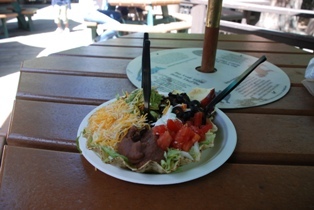 Visitors are required to keep all food materials in the container and not in the tent. 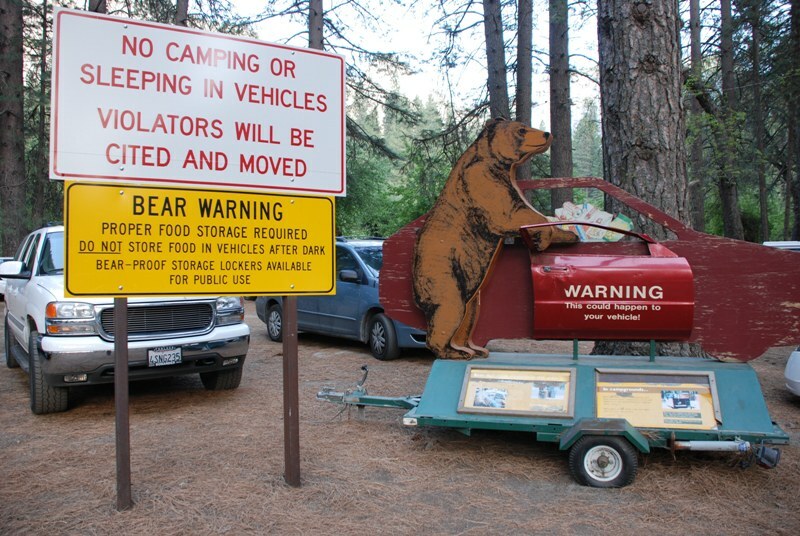 Park authorities claim that bears can be encountered at any time in high use trails. 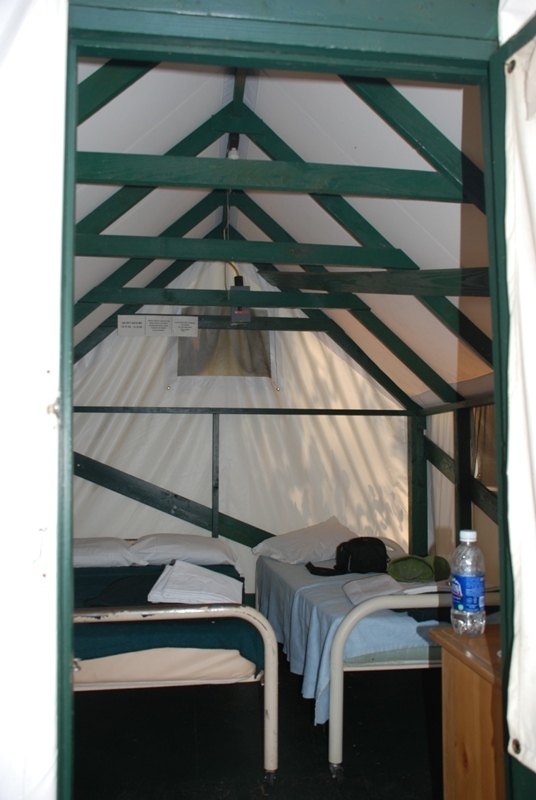 The inside of the tent. 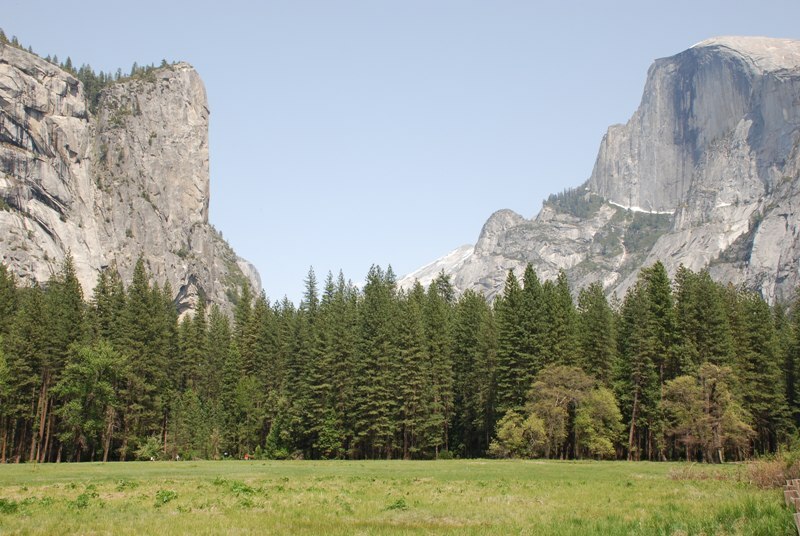 Yosemite Valley had been the habitat for California grizzlies until their extinction long time ago. American black bear is the species that continues to dwell in the valley and often makes its way to the campsites. Hence the need for the bear-proof containers. 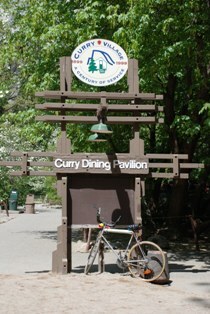 The sign welcoming visitors to the Curry Dining Pavilion. 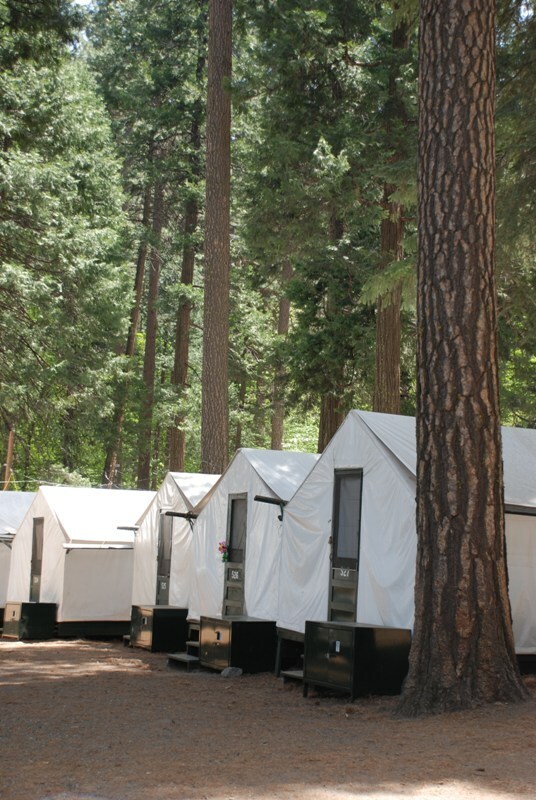 Yosemite Valley provides myriad accommodation options for all types of budgets ranging from backpacker’s camp to luxury rooms. 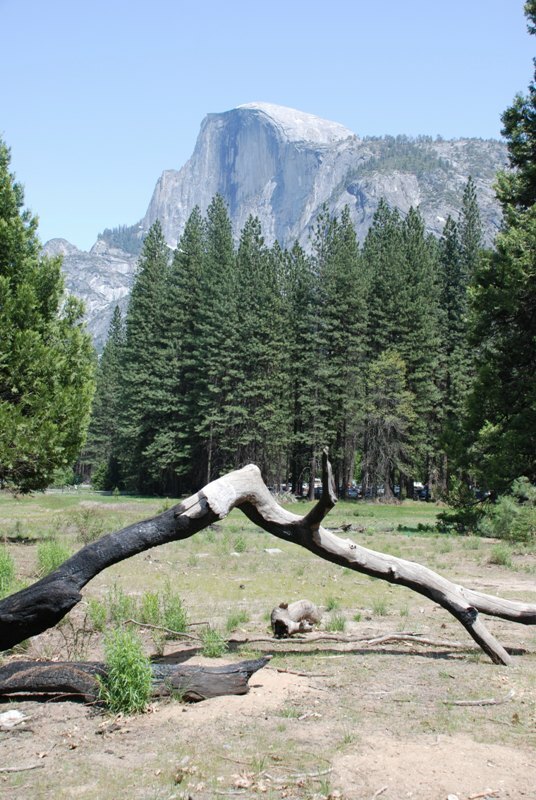 I like to call this a “Half Burnt Wood” with Half Dome in the backdrop. 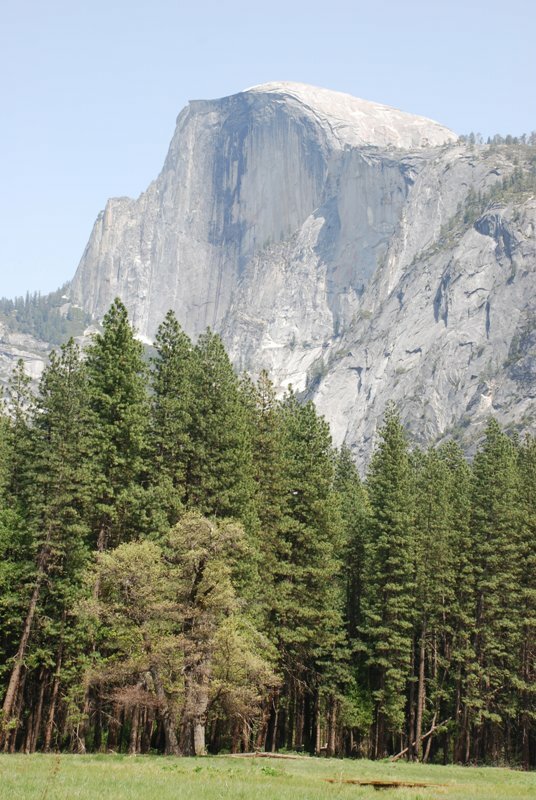 The protruding rock cliff on the left is called Washington Column. 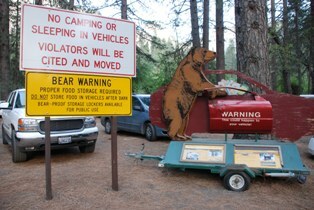 One of the many bear warnings scattered across the valley. 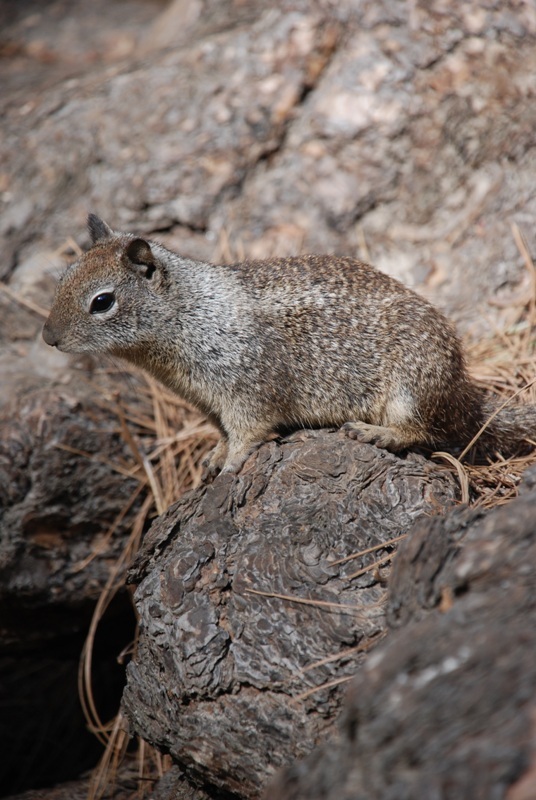 Visitors are strongly urged not to feed any of the wildlife as it would lead to unnatural feeding habits for them. This is again Half Dome up close and personal. Morning sunlight streams in while the face below Sentinel Rock embraces shadows. Lower Yosemite Fall (with drop of 320 feet) gushes out. I took a shot of this squirrel while walking near the shores of the Merced river. 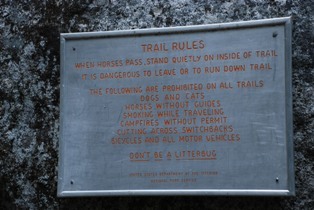 A metal plaque screwed onto a granite rock with orange text etched into it, very artistic! I found California a haven for vegetarians like myself – plateful of veggie tacos here – which tasted really good after an early morning walk around Mirror Lake circuit. If you did notice, the apple was not part of the deal actually, its something I chewed and put on the plate. 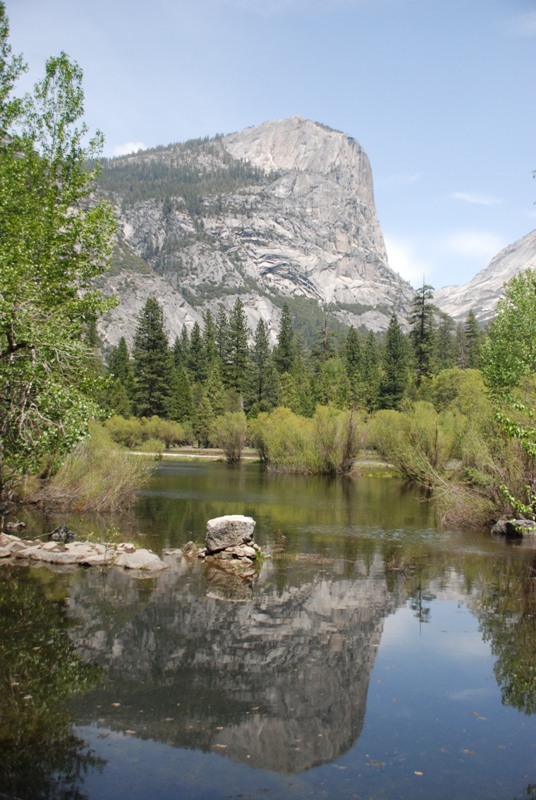 The Mirror Lake loop is a very pleasant two hour trail along Tenaya Creek. According to the locals, the lake has gotten smaller over the years and even dries up towards the end of the summer. Tranquil. I wonder how everything will reflect on a Full Moon night. I wish my heart was this pure and reflected everything as it were. 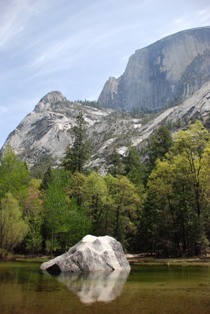 Trail towards Mirror Lake. 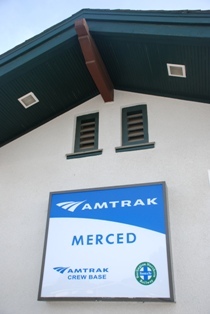 Train station at Merced, CA. I took Amtrak California’s San Joaquins train route from San Francisco to Merced via Stockton. From Merced I transferred to Bus #15 (part of Amtrak Thruway Motorcoach Route) to get to the village.